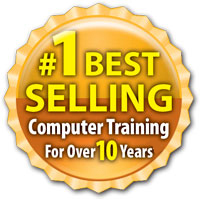 The Most Realistic, Interactive, and Complete Computer Training! 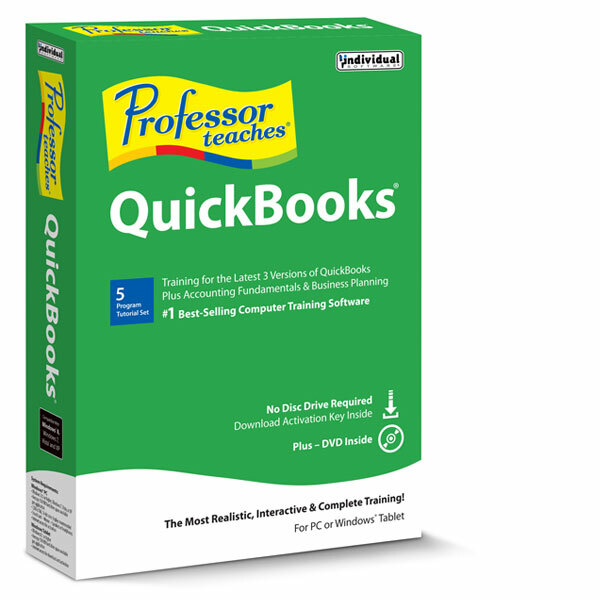 Professor Teaches provides realistic, interactive, and complete training for QuickBooks 2017, 2016 & 2015. 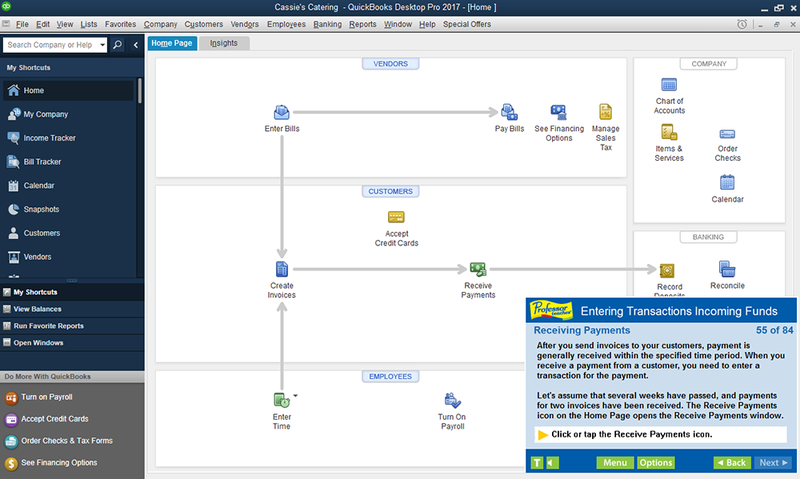 Learn the ins and outs of Intuit QuickBooks Pro, Accounting Fundamentals, and Business Planning. Each hands-on, interactive course provides everything you need to learn Accounting and Business Planning fundamentals and the latest versions of QuickBooks. QuickBooks, the premier small business accounting software, is designed to help small businesses manage product inventory, sales, invoices, company payroll, and other areas required to run a business. Learn how to improve your productivity and run your business more efficiently using QuickBooks. Each interactive course is organized for fast and easy learning with hands-on exercises to help you build new skills quickly. Covers QuickBooks 2017, 2016 & 2015 Features!! 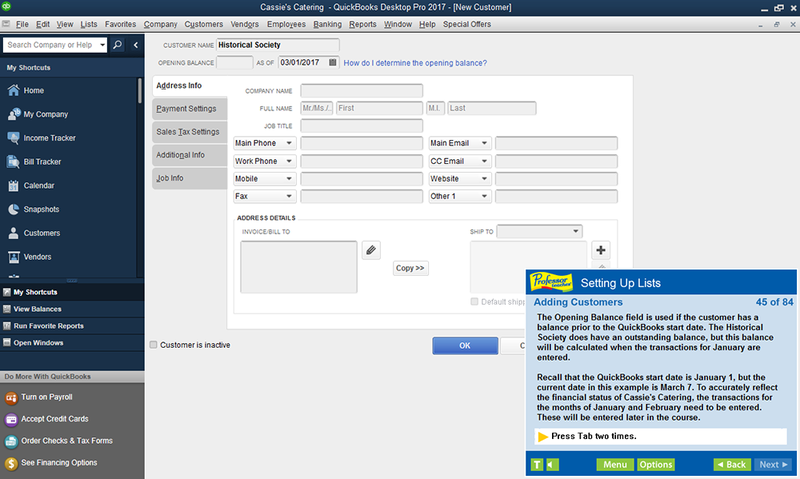 The Fast Way to Learn QuickBooks! Learn from each of the courses or just the one you need! More than just videos, you’ll interact to perform the correct action during each exercise for better learning and retention. 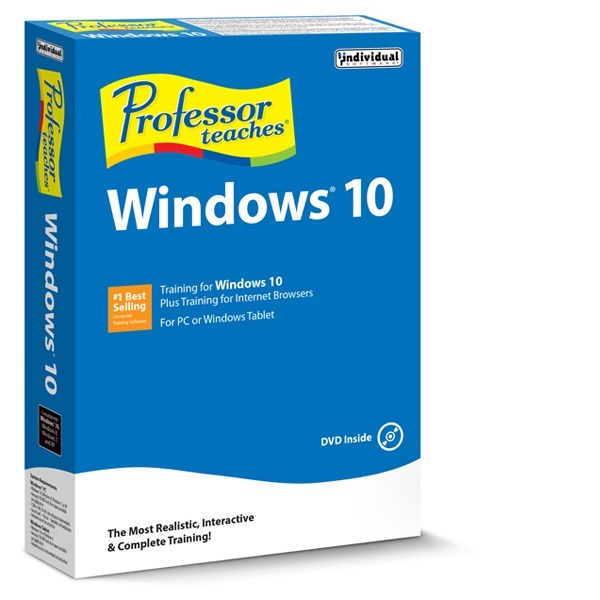 Hundreds of learning topics and beginner through advanced subjects are included. 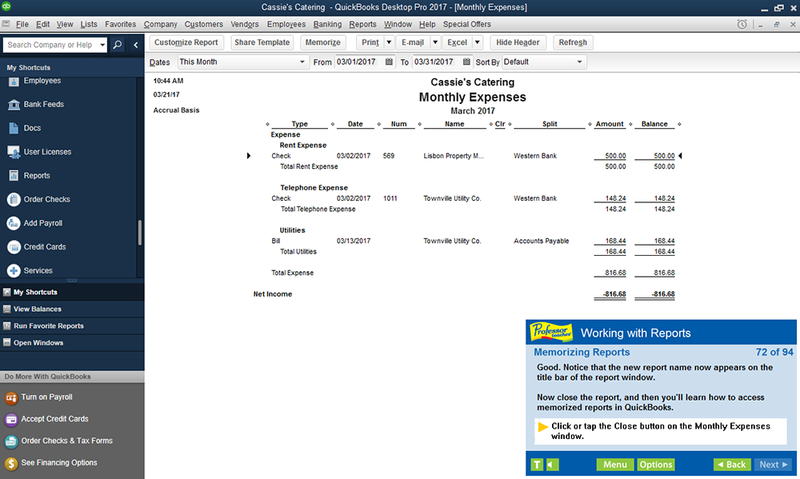 Teach yourself how to automate most of your accounting tasks: printing checks, paying bills, and tracking expenses. You can build your skills quickly to unlock the power of QuickBooks and expand your business. Chapters are organized into specific learning objectives — easily available from the main menu. Self-paced, interactive lessons allow you to practice in a realistic simulation of the software. Accurate screen presentations, menus, and buttons provide an easy transition to the real application. Step-by-step interactive exercises help you achieve high retention rates. Practical exercises and examples make learning easy. Introductions, summaries and end-of-chapter quiz questions all reinforce learning. Each course uses the same user interface and educational methods to ensure consistent quality throughout. Discover how QuickBooks can help you save time on every day financial tasks, from creating estimates and invoices to receiving payments, paying bills, and managing payroll. Learn how to store and organize all of your information, plus see all of your customer, vendor, and employee information in one place. With QuickBooks, you can finally manage your financial data accurately. 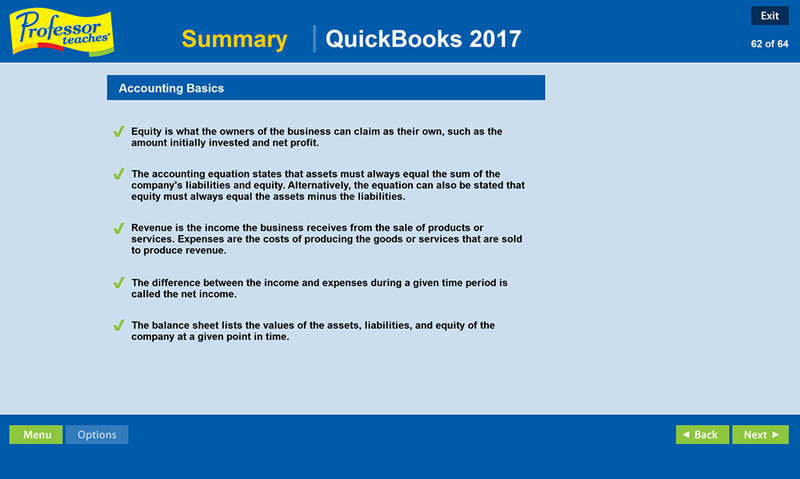 Accounting Fundamentals: Over 40 Lessons! If you’re new to managing business finances or would like to brush up on the basics, Accounting Fundamentals is a great place to start. This course covers the main principles and concepts of accounting, making them easy to understand and apply. Business Planning: Over 30 Lessons! In business, preparation is 80% of the battle. Business Planning teaches you how to prepare and manage your business the right way. In this course, you’ll find valuable information about marketing strategies, organizational structure, negotiating with investors and lenders, and creating a formal business plan. 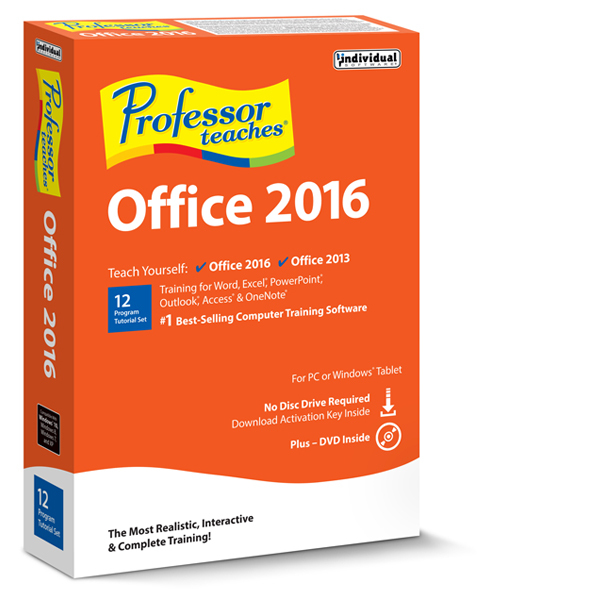 Get quick assistance with Professor Answers. Find answers to your questions faster and easier than navigating Help Systems. 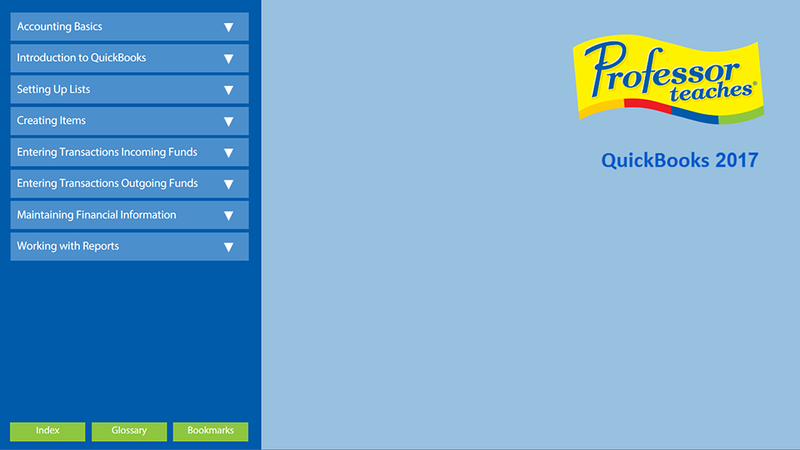 Powerful search and browse features help you locate the specific topic you need, right when you need it. 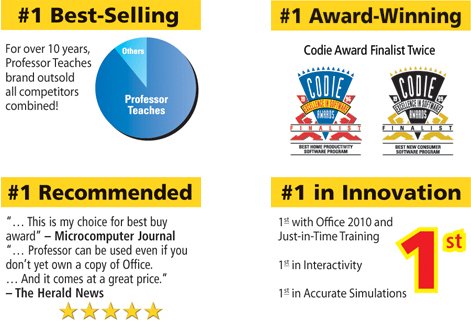 In addition, Professor Answers also provides mini-training sessions for quick knowledge and experience.